Each week I enjoy perusing the Internet for inspiring home decor and vignettes that really capture that rustic or shabby chic look in a unique and eye catching way. I thought it would be fun to wrap up the week with some of my favorite finds. Each of the looks offer a little something different that may help to get you inspired for your own decorating project. There is so much that I love about this space! First of all, is all of the white. 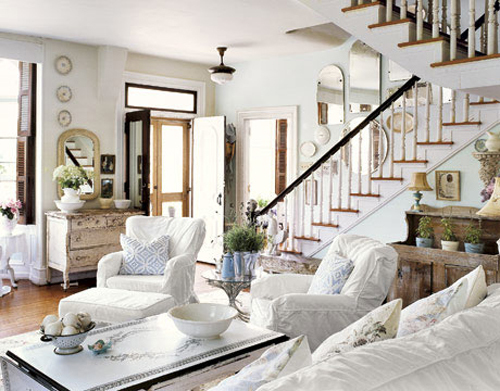 Both the pristine and the distressed combine to add shabby and chic to the room as well as dimension and texture. I also love all of the vintage pieces. The old window and door are wonderfully rustic and the hat and old suitcases add a sense of nostalgia making the lace curtains and ornate desk look right at home. To see more vintage decorating ideas, see how to decorate with vintage treasures. 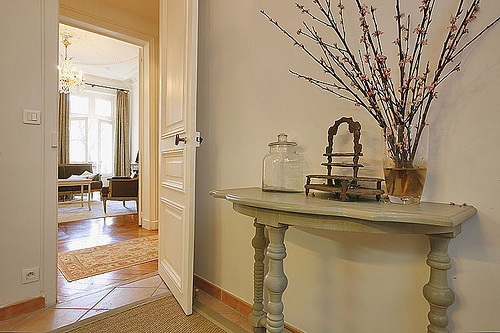 Hallways don’t always get a lot of attention but when decorated can add a lot of impact. This simple design uses a chic table to display some rustic elements that are both soothing and eye appealing. The tall branches in the vase make it unnecessary to add any wall art. I’m not sure about the water color myself – I would have to have clear clean looking water in the vase. Instead, I may add a little color to the jar on the left by partially filling it with some neutral river rock. This living room wows in white! Nothing sterile and boring about this room. The cushy furnishings and distressed wood make this totally inviting. The few darker wood pieces really stand out! 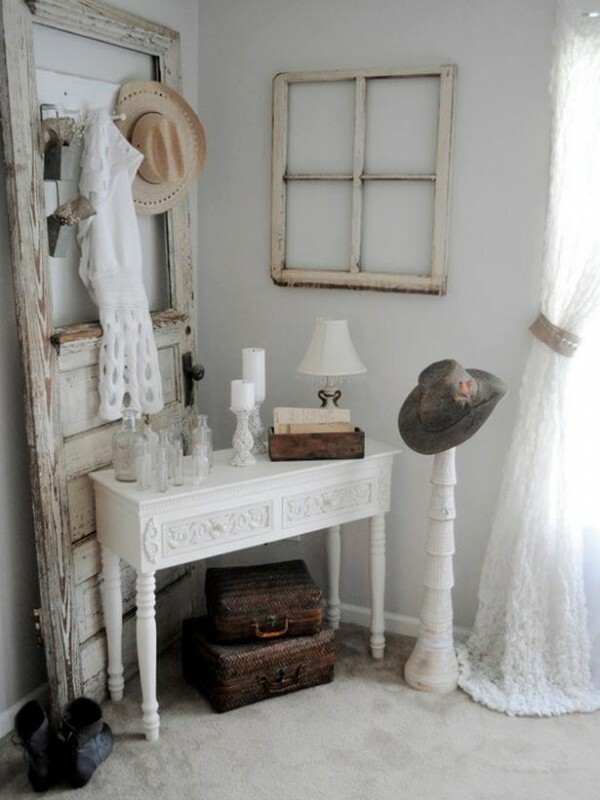 I just love all of the white in a shabby chic style. For more inspiration, see decorating in white for simple shabby chic. This bedroom is full of great design elements! The dark ornate furniture contrasts nicely with the simple white walls and the shabby white wood beams on the ceiling. Romantic chic is added with the beautiful chandelier and you get a warm cozy feel with the lush rug. If you’re interested in more bedroom ideas, check out these eight ideas for shabby chic bedrooms. 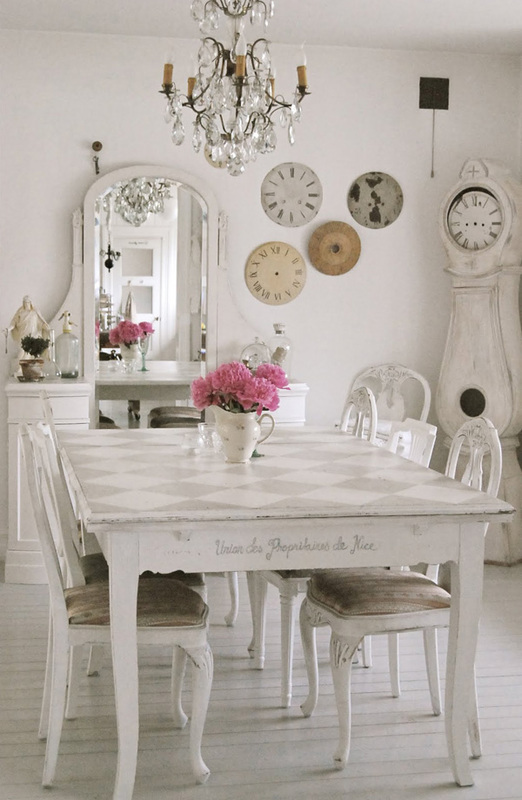 I liked the whimsical features of this shabby chic dining room. Adding just a touch of bright color against all of that white also brings a punch of cheer! I hoped you enjoyed this collection of shabby chic looks! If you would like to try some fun projects, check out my post on DIY Shabby Chic.